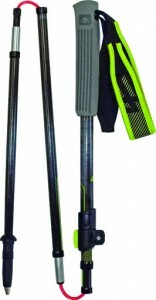 Masters is one of the largest companies in the production of ski poles and trekking poles in the world. Its good reputation is constantly growing thanks to their research, development and important partnerships with their suppliers. Masters as a company is environmentally aware and has a sharp look to the future due to a sensible source of innovation: the attention to detail. Small steps at a time can achieve great outcomes. A pole realized for experts that can appreciate the high potentiality. It is ideal also for practicing Trail Running. Realized for an expert and experienced hiker.